You will be asked if you want to 'run' or 'save' the file when the download is complete. The run option will start the installer as soon as the download is complete, the save option will save the installer to your computer so you can install the software later. Before Windows starts the installer it will check the 'digital signature' to make sure it has been signed by us, and the code has not been altered. 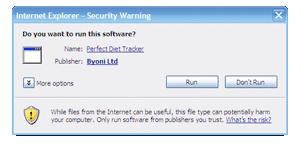 Check the publisher is listed as 'Byoni Lifestyle', then click the 'Run' button to start the installer. 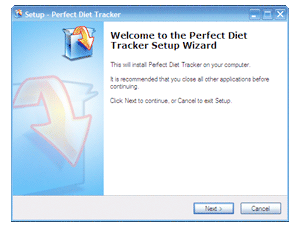 The installer will now take you through the easy step by step setup of the software, placing a Perfect Diet Tracker icon on your desktop so you can start your free trial. 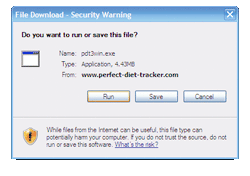 To start your free trial simply double click on the Perfect Diet Tracker icon on your desktop.